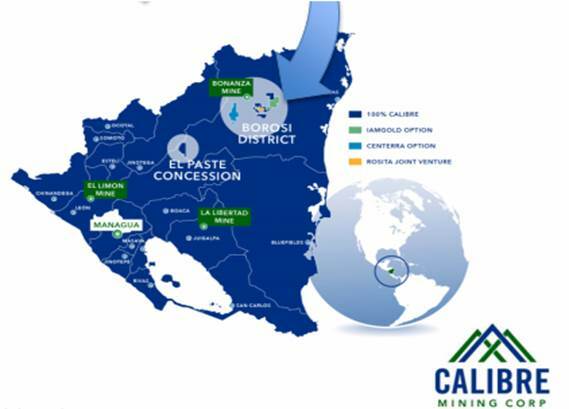 Ryan King, vice president of corporate development at Calibre Mining, sits down with Maurice Jackson of Proven and Probable to discuss his company’s joint ventures, exploration in Nicaragua and strategic plans. Maurice Jackson: Joining us today is Ryan King. 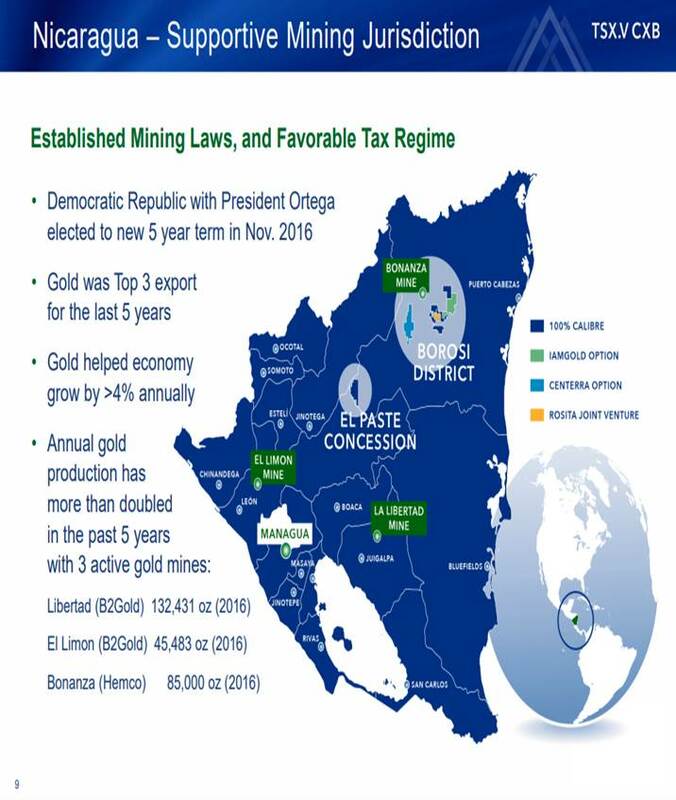 He is the vice president, corporate development, of Calibre Mining Corp. (CXB:TSX.V; CXBMD:OTC), which is exploring for world-class gold, silver and copper deposits in Nicaragua. For someone new to the story, who is Calibre Mining and what is the thesis you’re attempting to prove? Ryan King: Calibre Mining’s thesis is twofold. One, we’re exploring for world-class discoveries in Nicaragua. We just had over 8 million ounces of produced gold in this district that we’re exploring. Second, we believe Nicaragua provides optionality right now for our shareholders. Our team has a proven track record of successfully acquiring, advancing, optimizing and selling projects. Recently, Calibre has gone through a restructuring. We’ve added some new people to our team. We are trying to duplicate what we’ve done in our last deal called New Market Gold. That is go out and buy advanced stage development or producing gold opportunities and optimize those operations, spend money on them, drill them, find more resources, and potentially we’d love to merge or sell the company after we’ve spent some time adding value to the company. Maurice Jackson: You referenced Nicaragua. Provide us with some historical context on the region in which your project portfolio is located. Ryan King: For those who don’t know, Nicaragua does have a bit of a checkered past. It’s gone through different political situations, it’s gone through different civil war during the 1950s and 1960s. There is a significant period of time where there was no mineral exploration. It was a country that was difficult to work in. However, over the years, we’ve seen gold developers and gold producers go there, Falconbridge and others, and there’s been some great gold development. There’s been some great gold production. We have a couple projects around us, and actually within portfolio, that has produced multi-million ounces, produced copper. But it has been underexplored for a number of decades. 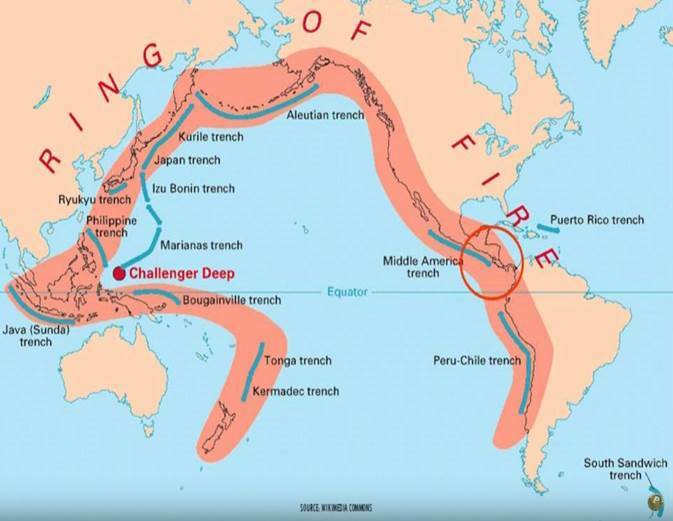 One of the virtues of Calibre Mining is that we are on the Ring of Fire, a well-known phrase that’s used within the geological and mining community known for hosting large copper-gold deposits. 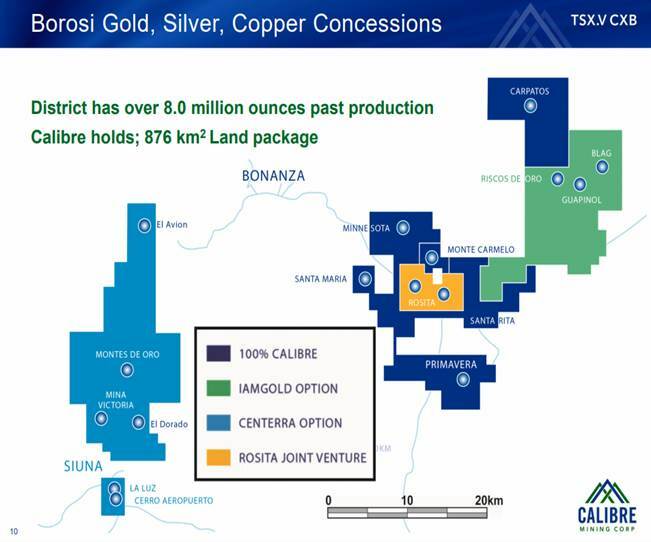 Calibre was able to pick up this land package from Yamana in 2009, which had recently done some restructuring. I believe it had recently merged with a company back in 2007, 2008. After the merger Yamana was looking at doing different things. There was no production in the portfolio there in Nicaragua currently or was there any at the time that we had fired these. These are just exploration projects around and within concessions that has seen historical production. Maurice Jackson: Calibre’s flagship Borosi project has district-scale discovery potential in Nicaragua. Where are your projects located and how much of the land position does Calibre have there? Ryan King: The projects are located in northeast Nicaragua. We take a flight into Managua, which is the capital of Nicaragua. We then take a flight that is run daily from Managua up to either Rosita or to Bonanza. Borosi actually is originated from Bonanza-Rosita, and so three towns, the three mining and mineral exploration towns, in our concessions. That’s where Borosi comes from. Our land package is vast, covering over 800 square kilometers. Noteworthy to mention, we’ve brought in some significant partners, Iamgold, Centerra Gold, and Rosita Mining, to help us advance our projects and explore the numerous targets that we have. Maurice Jackson: Mr. King, we’ve covered some good background. Walk us through your flagship Borosi project. Ryan King: The flagship project is located in northeast Nicaragua. We have 400 square kilometers 100% owned in these concessions. They are all butting to or very closely adjacent to each other. We have a joint venture with a small junior called Rosita Mining. This joint venture is a past-producing skarn deposit that produced over 300 million pounds of copper. 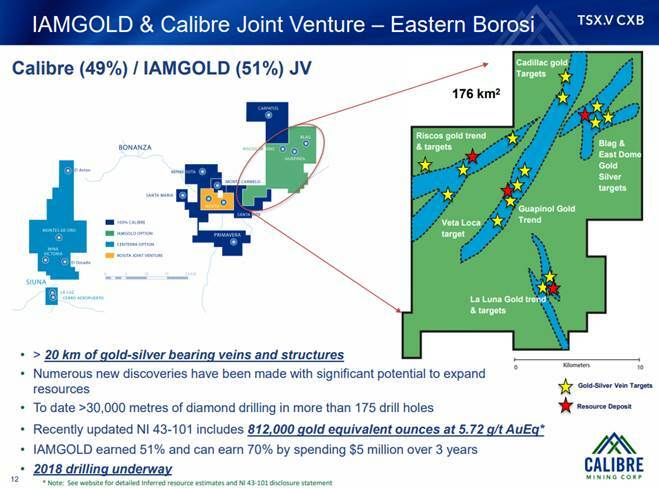 We have a joint venture, which is now 51%-49%; 51 for Iamgold, 49% owned by Calibre. This is with Iamgold. Iamgold is now currently drilling on low sulfidation epithermal vein discoveries. It has an option to go up to 70%. 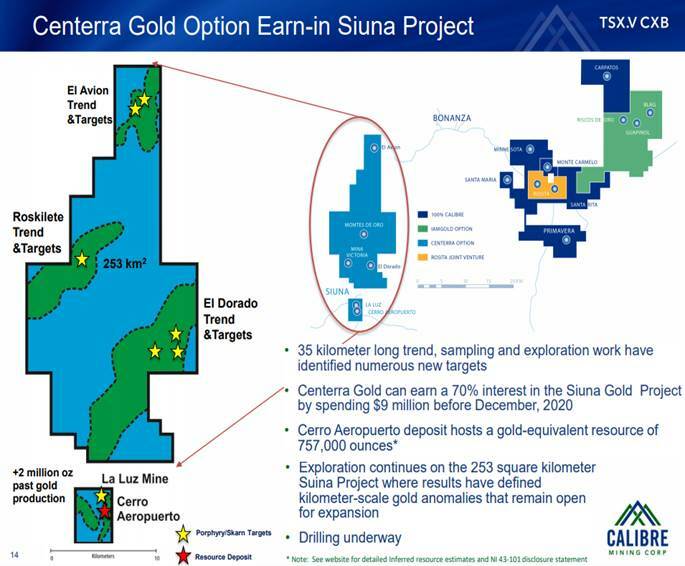 Then on the Siuna Gold project, we have an option earn-in with Centerra Gold. Centerra as well can earn in to 70%, very close to its 51%, its first earn-in. 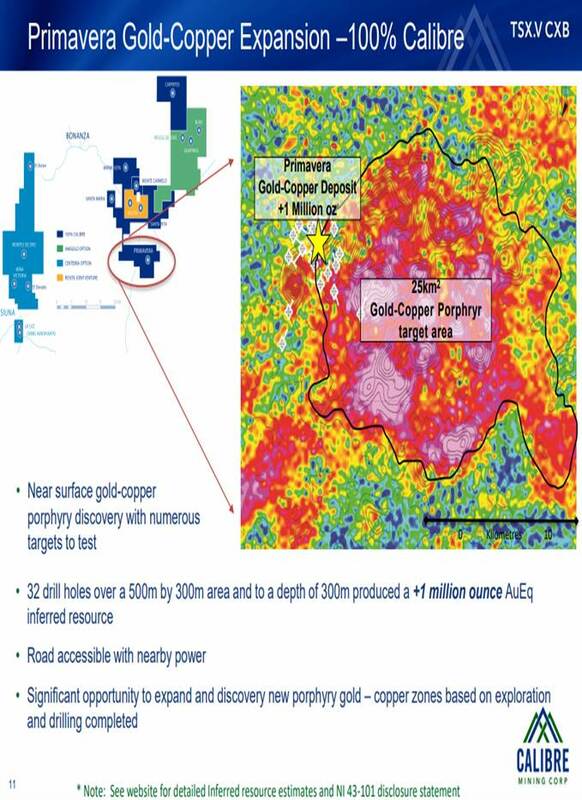 It is exploring for large copper-gold porphyry systems. It’s also exploring for skarn deposits. That’s exactly what the La Luz past-producing mine was, a skarn deposit, at least over 2 million ounces of gold. Maurice Jackson: Expanding the narrative on your project portfolio, Calibre Mining has low sulfidation epithermal gold-silver deposits. What has the company excited here? Ryan King: You brought up low sulfidation epithermal deposits, and that’s exactly what we’re seeing over tens of kilometers based on the geochem anomalies, based on the Lidar surveys that have been done with Iamgold on the eastern Borosi concessions. What gets us excited here is just the vast amount of underexplored nature of this region. What gets us excited is the fact that quite often when we do our geochemical analysis and we identified new anomalies, we’re seeing a good correlation to the drill results anytime we’ve had good geochem anomalies on surface, and that would be an identification of a gold-silver vein. Quite often underneath that, we are finding high-grade gold over 1 up to 15 meters of width. For an underground type gold system, I would say, at a bare minimum, what you’re looking for is something between 2 and 5 meters running anywhere from 4 to 8 grams per ton gold in gold equivalent. That’s going to get you, we believe, a very good identification of a good underground gold system. The nice thing about these epithermal veins is they’re outcropping quite often, and so we’re able to identify them on surface. On a preliminary engineering basis, what we could see here on some of these systems is that you have potentially a small open pit that would transition into an underground ore body. The nice thing about what we have here at eastern Borosi is we have numerous veins swarming as well as parallel veins that you could see a multiphased, multi-ounce production scenario from a small distance. Yet over and over, we’re seeing tens of kilometers of strike length, tens of kilometers of parallel veins. We think there’s a huge amount of opportunity to expand on the current 800,000-ounce resource that we have identified there. Maurice Jackson: Before we leave the La Luna Gold-Silver Deposit, we have some news. Can you share the details with us? Ryan King: Absolutely. We announced some additional drill results with our partner Iamgold, which has been a very solid partner. It has been continuing to earn in annually. We run the program there. 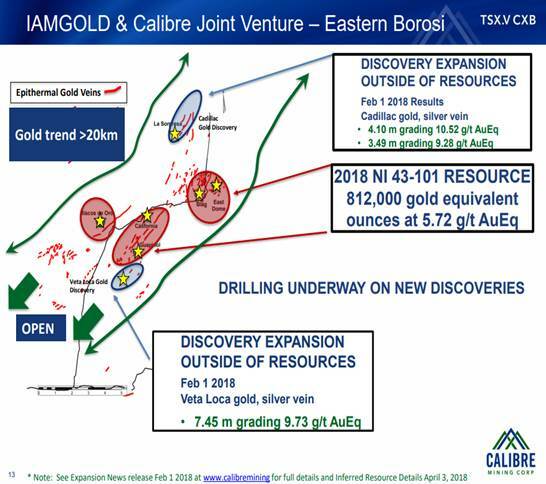 We identify the targets and then we work with Iamgold to confirm that we should proceed and drill a number of these targets. We announced 8.7 meters, grading 6.8 grams per ton gold equivalent, as well as 4.5 meters grading 7.29 grams per ton gold equivalent. These are some of the highlights, but that meshes in very nicely with what I was just mentioning in terms of widths, in terms of grade, what you’re looking for in these types of systems. One of these, I believe it’s the 4.4 meters grade, 7.2 grams per ton gold, is a brand new discovery that we’ve made there! This is north of our La Luna resource, about a hundred meters. We’ve also identified a long strike and about 400 meters to the north. On surface, we’re seeing excellent geochemical anomalies running multi-ounces on surface. We believe that this could lead to quite an extension to the zone and very likely and potentially a good size increase in resources when we do calculate resources. This is all outside of current 2018 43-101 resources that we did earlier in the year. Calibre is very encouraged by this and we think this is going to be a very beneficial impact to the company going into 2019. Maurice Jackson: Last but not least, Calibre Mining has the largest gold skarn deposit in the district, the La Luz Deposit. Walk us through the deposit. Ryan King: Calibre has never operated the La Luz, which was operated decades ago. But one of the big, important aspects of any sort of mineral exploration is to go and discover and explore around past-producing districts and past-producing gold mines. What brought us here and what got us excited about this is the potential at La Luz. La Luz was a past-producing gold mine, producing over 2 million ounces of gold and, from all documentation we read, was very profitable. This started at surface. This was a high-grade skarn system that was started by very large trenches and morphed into a high-grade underground gold mine. Now I can’t remember the exact year that this happened, but the hydro dam broke and flooded the mine. If I recall, there was hundreds of thousands of ounces down below where they had finished their mining and stopped mining due to the flooding. There’s probably north of 500,000 ounces that could be mineable ounces below where the mine is currently stopped and, of course, flooded now. Myself, our executive chairman, Russell Ball, and Greg Smith were just in Nicaragua. We drove by this. It’s right on the edge of town. Again, these are past-producing mines. These towns, in this case Siuna, is very familiar with gold mining or any mining of that nature, very mining-friendly locations. What we have done over the last little while, instead of dewatering and trying to get back in there and mine, is look for additional resources outside and around La Luz. Could you dewater it? I think that’s quite a potential. Could you then get back in there underground and start to look for more ounces? As I mentioned, there were hundreds of thousands of ounces left by the previous miner. But what we’ve focused on over the last little while is trying to find and identify additional skarn deposits in and around La Luz. We do currently have, adjacent to La Luz, a 750,000-ounce gold resource. We’ve been doing some drilling around that. We’ve been doing some drilling down strike from that as well in the Huracan district where approximately a couple of kilometers down strike to the south, we’ve had some good what looks like porphyry type mineralization coming into the system. Lots of potential in and around La Luz. Again, our partner there is Centerra Gold. We’re getting close to a 51%49% joint venture now, and it has an option to earn in to 70%. We’ve been drilling a number of targets, not only Cerro Aeropuerto but a number of targets along the whole 253 square kilometers that is auctioned to Centerra Gold. We’ll see where we decide to drill next year. There’s just so many different targets along this whole trend that look interesting to both Centerra and ourself. Maurice Jackson: Mr. King, we’ve referenced three different deposits and three different joint venture partners. A multilayered question here. Is there active drilling on all three of these deposits and what is the predominant relationship with the joint venture partners? Is that their focus only is to drill? Ryan King: Actively, right now we have two diamond drills turning with Iamgold, and have been just about the whole year, on the eastern Borosi concessions. As a reminder, eastern Borosi has over 800,000 ounces identified in an Inferred 43-101 resource. Over the course of 2018, drill results come out that are all predominantly outside of those resources, so two drills turning all year and currently have two drills turning. We just spit out the results today from the La Luna Gold project, where we’ve identified new mineralization outside of the current resources. Earlier in the year, we identified a project in the Borosi concessions with Iamgold called Veta Loca, which is outside our resources. There we drilled 7.4 meters grading 9.7 grams per ton gold equivalent. We identified new zones outside of resources at La Sorpresa or Cadillac, where we drilled 4.1 meters grading 10.5 grams per ton gold equivalent. A lot of activity with Iamgold is underway. There’s just so many different targets on the eastern Borosi concessions. That’s where Iamgold has earned in the 51%. It has the option by spending another $5 million to earn into 70%. As well, in our 100%-owned ground, Calibre drilled a couple of different targets, the San Francisco target, the San Isidro target, all around Primavera. Primavera is a very classic copper-gold porphyry system. These porphyry systems are lower grade, but they can get to be very, very large, hundreds and hundreds, if not billions, of tons of mineralization running between 0.2 and 0.8, 0.9, one gram per ton, if not more, gold, and anywhere from 0.2 and up for percent copper. We are drilling what looks to be a 25-square-kilometer porphyry district area that have a number of signatures that look similar to Primavera. This year, I believe we drilled about 20 to 30 holes. We have identified lower grade mineralization over long widths, but we haven’t gotten into a new higher grade system. Currently, we’re not drilling. We did a grill program this year. That is approximately 2,000 meters. What the plan is for Primavera and our 100%-owned district now is we have identified numerous targets. We’ve just recently gone through a corporate restructuring. What we’ll very likely do at this stage is now that we’ve dressed it up and, as I mentioned, identified a number of targets, we’ll look to bring in a partner, very likely, on Primavera or Minnesota. We’ve recently raised $5 million. We’re looking at a bit of a strategic shift within the company, not just explore in Nicaragua but because we have a very well-known team, look to acquire additional opportunities for advanced stage gold or production opportunities. We’ll look for a partner on Primavera and some of our 100%-owned projects. Centerra is spending $9 million to earn into 70% on the 253-square-kilometer Siuna concessions. What they’re looking for, again, are these big copper-gold porphyry system, multi-element porphyry systems. We did drill up in the northern part of our district at El Avion. We’re waiting for drill results from that. We are currently drilling right now, so there’s activity on the ground with Centerra right now. It is drilling a project called the Roskilete, which is around the center of the concession. These are all drilling following up on geochemical anomalies that have been identified. The whole almost 253-square-kilometer land package had been sampled for gold, silver, copper, and looking for concentrations on surface, and then following up with drilling. Centerra right now is drilling the Roskilete gold-copper target, and we hope to have results probably in early 2019. There’s still a lot of activity happening. Maurice Jackson: Ryan, for someone that is not familiar with the mining jurisdiction in Nicaragua, tell us about it. Also, share with us how is the company positioned as far as permitting? Ryan King: That is a very important question when you’re looking at investing in exploration companies. If a company can find multimillion ounces, but can’t advance those multimillion ounces to a mine and production, it’s worthless to the investor. A very good question. Calibre has been in Nicaragua since 2009. One of the reasons we chose to go to Nicaragua and specifically chose to acquire the Bonanza and Borosi concessions is largely because this is a past-producing district. This is a mining district that has produced over 8 million ounces of gold, 300 million pounds of copper. These towns of Bonanza, Siuna and Rosita are very familiar with mining. In fact, one of our partners, Rosita Mining, has been doing months and months of work to advance a permit in these concessions on the Rosita concessions that we’re in joint venture with. It has recently received its permits to build a treatment plant that will process all the past stockpiles from the originally producing Rosita mine. Because of the past production nature, these towns are very familiar with mining. Actually, for the local artisanal miners, it’s very important for them, and mining there where they’re following some veins and chipping away at some rocks and pulling out some more. It’s important for them and part for their lives to find mineralization. As long as you can work very closely with these communities, and we have been closely working with these communities for a number of years now, you build up long-term relationships. We also have a very connected and well-known person that works with us, Angelica, who has been in-country, I believe, most of her life, working with these different villages and communities that we’re involved with. It’s really taking the time and educating, talking about socio-economic benefits, working with local communities on a daily basis really. That’s what it takes for drilling permits as well. It’s not just permitting to build or permitting to advance a project towards production, it’s also a very strict mining law in Nicaragua, which is, I believe, very important. They’ve never bent the rules, they’ve never changed the rules since we’ve been there. I think this is important because they’re following very strictly to the code of conduct and the mining law that they have in place. That might speak to the president. President Daniel Ortega, was the son of a miner. I can’t recall exactly which mine he was born at, but it was either La Libertad or El Limon. Those are the two main gold mines in the country. Those two gold mines produce between 100,000 and 150,000 ounces of gold a year, and they have for decades and decades. They’re owned by B2Gold, our largest shareholder. 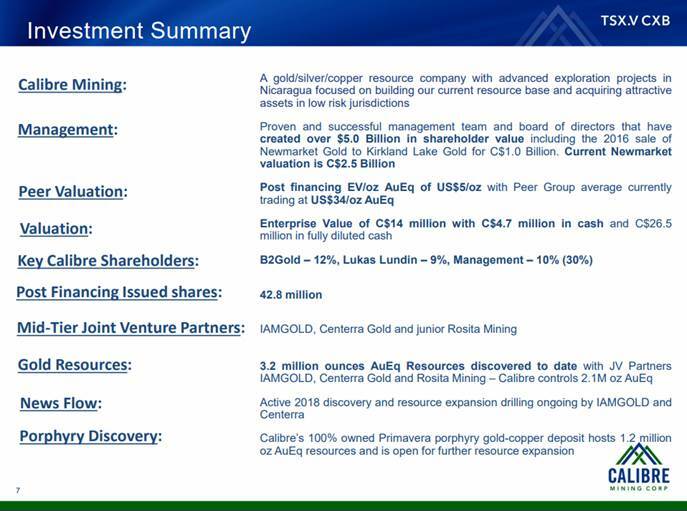 B2Gold owns 12% of Calibre Mining. The country is very familiar with mining. It’s a very significant contributor to GDP. I believe it was somewhere between 3% and 4%. The gold helped the economy and growth in GDP. But the important aspect here is that they do follow their mining law very closely. For drilling, you need to go through consultation with community. You need to apply for permits for drilling. They need to come out and check the sites. We work with the communities, regulators, making sure that we’ve done all of our consultation work and CSR work. They do follow that very closely, and we think that’s great. We think that’s very important. Never at one time have we had any issues in-country with getting permits, renewing concessions, anything like this. We believe, so far, it’s been a good place for us to do mineral exploration. Maurice Jackson: Very favorable response here. Tell us about existing infrastructure and what this means for shareholders regarding capital expenditures. Ryan King: Another good aspect about advancing a project to become a mine. Very similarly, if you have no relationship with communities, then you can’t advance a project with community support. Very similar to infrastructure. If there’s no infrastructure around and infrastructure needs to be built by government or by companies, it’s going to take a lot longer. Luckily, in Nicaragua, a lot of different advances have been made over the years. I believe the current president, Daniel Ortega, has done a good job of building infrastructure and has expanded foreign investment into the country. Actually, to bring that up, there has been a Chinese group that has been doing engineering work and evaluation work on building a new canal through Nicaragua. I believe they’ve already spent upwards of $1 billion to look at a way to bring a canal through Nicaragua, through one of their very large lakes they have in Central Nicaragua there. That indicates, first, that foreign investment is welcome. Second, one of the exploding industries in Nicaragua has been tourism. You talk to different people around the world, and Nicaragua has become a vacation destination. New hotels have gone up, new resorts are there. It’s become a place very much like Costa Rica where people want to go and vacation. It’s a big surfing town outside of Managua. There’s been a lot of different foreign investment in real estate and development and hotels. On that topic, in terms of infrastructure, our CEO, Greg Smith, has been to Nicaragua for years. He was there early 1990s, and he recalls the roads being very terrible, very difficult, long, long bumpy roads. Whereas now he’s noticed a very vast difference in a lot of the roads have been paved, a lot of the roads have been fixed. Road infrastructure has changed drastically for the better, from Managua all the way up to the northeast Nicaragua where our projects are, so excellent roads. Additionally, he’s noticed now all of the communities, Rosita, Bonanza, Siuna, are on the hydroelectric grid, and they’re continually upgrading. We noticed when we were just there brand new power lines. It’s just a matter of stringing those lines up to the power grid and they’ll have brand new power. You could see all of the developments that are happening there, the pro developments that are happening there. I believe it’s to help attract foreign investment into the country and connect all of the different communities to the electrical grid within Nicaragua. From that standpoint, I believe the current administration has done a very good job of advancing their infrastructure, even though Nicaragua is one of the, if not the second, poorest country in Central America. Maurice Jackson: Mr. King, before we discuss the management team, are there any reversionary interest and/or royalties on the Borosi project? Ryan King: Yes, there are. To the government, there’s a 3% royalty. On our 100%-owned Primavera project, I believe it’s 1% or 1.5% additional royalty to B2Gold. Other than the government’s 3% royalty and I think a 27% or 30% tax rate, nothing else. Maurice Jackson: Any reversionary interest, sir? Maurice Jackson: Okay. Are there any redundant asset such as a patent mining claim? Maurice Jackson: All right. You’ve referenced this before, but just for the record, what is management’s philosophy? Are you looking to build a mine or arbitrage? Ryan King: This is an important question for current and prospective shareholders. I think this dovetails very well with our strategic plan. Everyone on our management team and our board of directors has been involved in mining for decades. 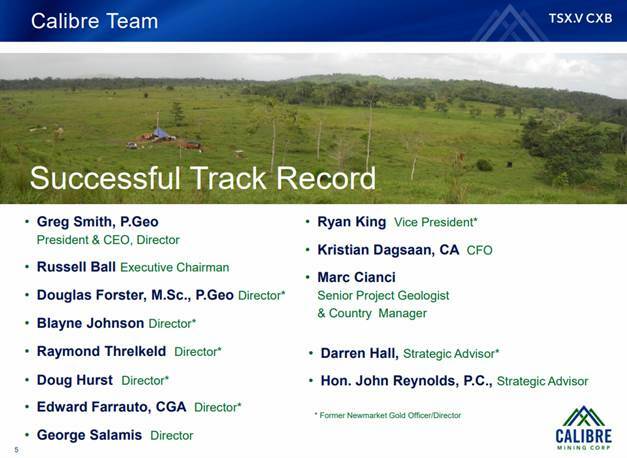 This team has been involved with discovery of multimillion-ounce deposits through acquisition. They have been involved in raising significant hundreds of millions of dollars in capital. Furthermore, they have been involved in development-stage projects that go on to feasibility study and then become a mine. Lastly, they have been involved in royalty companies that have gone on to transactions that seek financial windfalls for shareholders. 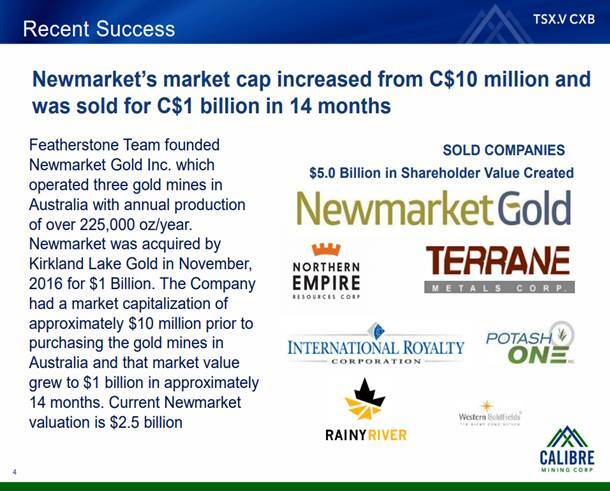 Very recently, the majority of our team was involved with a company called Newmarket Gold. Newmarket Gold was a large portion of our team on Calibre Mining. Newmarket went out and acquired three producing gold mines. These gold mines were located in Australia. At the time, Newmarket had an exploration project in Newfoundland, in Canada. The beginning part of 2015, we felt that the opportunity with the landscape of the gold producers and the gold price, roughly around $1100 gold at that time, was the right time to go out and acquire production and hopefully find ways to optimize them. We did that. We found three producing gold mines in Australia, one of which was called Fosterville. In each one of these mines, we had recognized that not a lot of capital and not a lot of exploration work had gone into some of these mines. We immediately talked to all of the local and ground geologists. There were numerous targets. We immediately deployed a program of exploration drilling on each one of these projects, and we had success. We found very high-grade extensions, particularly to the Fosterville Gold Mine. We advanced that on, grew the resource, optimized the mine, and went on and did a merger with Kirkland Lake Gold. Kirkland Lake Gold has been one of the darlings in the gold space, if you can find a bright spot in a difficult market. Kirkland Lake has had well over 200% and 250% returns for shareholders since that transaction. A lot of it has to do with Fosterville. This Fosterville mine has become a very high-grade underground gold mine that is producing well over 200,000 ounces of gold a year, a very low cash cost. It’s been an incredible win for our shareholders. This team, what we’d like to do, again, is, because we feel now is the time to be acquiring either producing or very advanced stage gold opportunities, we think now is the time just because the disinterest in the sector. The gold price has not been bad. We’re sitting around over $1,200 gold. But the price to net asset value in so many of these different seniors and mid-tier gold producers is very low, multiyear lows. We think it’s a great opportunity to take advantage of, if we can acquire the right deal with the right capital structure. Maurice Jackson: Short term, we’re looking at optionality and, long term, we’re looking at arbitrage. Is that correct, sir? Ryan King: Yes, if we can execute on our plan, which I believe we will, there’s optionality in Nicaragua and we have over 2 million ounces of defined resources there, we have great partners. Then at the same time if this management team and board of directors can execute and acquire quality opportunities, we think, yes, this is going to be a great arbitrage opportunity. Maurice Jackson: Switching gears, I learned from some of the most serially successful in the industry, ranging from Rick Rule, Doug Casey, Jayant Bhandari, Mickey Fulp and Bob Moriarty, that the people running the business are equally, if not more, important than the latent material in the ground. Mr. King, please introduce us to your board of directors and management team and the unique skill sets they bring to Calibre Mining. Ryan King: First and foremost, Russell Ball our executive chairman, comes from Newmont and Goldcorp, really ingrained into the business for decades. He was the chief financial officer at Goldcorp most recently. He’s now our executive chairman. Now that we’ve restructured the company, we’ve recently gone through restructuring, we raised $5 million, 45 million shares out, approximately, today, December 2018, market capitalization of $15 million. It aligns with our plan of going out and buying production or acquiring production through the Goldcorps of the world, mid-tiers, seniors. Hopefully, we’ll find a way to find the right opportunity. Russ is a fantastic addition to the team and huge relationships within this business, and absolutely knowledgeable, intelligent gentleman that knows what he’s doing. Douglas Forster, Masters of Science in Economic Geology, Doug is brilliant at merging the science and resource aspect of companies with capital markets. Doug has been very successful with the Hunter-Dickson Group, Bob Hunter and Bob Dickinson, way back in the 1980s where they discovered Mount Milligan, a big copper-gold system, and went on to sell that and numerous other projects in 2006 and bought back the Mount Milligan project that been undeveloped, advanced it through permitting and feasibility study, and then sold Thompson Creek. 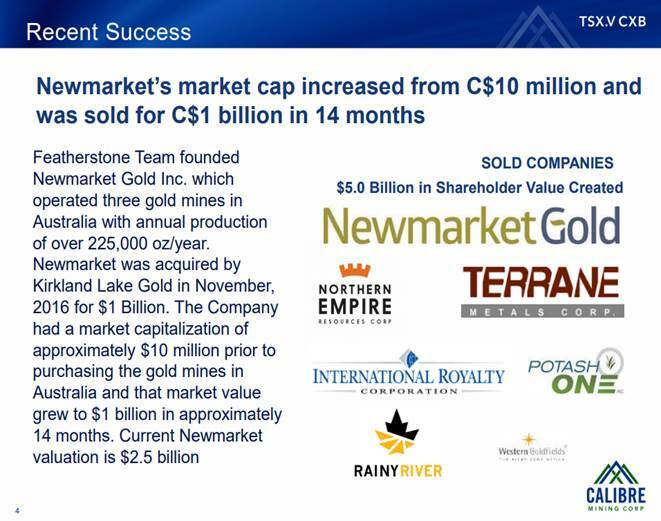 His most recent success, one of the founders and president/CEO of Newmarket Gold that went on to sell for a little over a billion dollars to Kirkland Lake. Huge, huge asset within this company. One of the primary reasons that I’m part of this company and part of this group is because of Doug. His experience, his expertise and track record speaks for itself. His partner and director, Blayne Johnson. Both Doug and Blayne are founders of Calibre. They were also both founders of Newmarket Gold. As I mentioned, we were very successful there going on and at advancing gold production towards a place where we felt it was value-add to merge with another company, Kirkland Lake. Kirkland is now a $5 billion company and I would say one of the darlings in the business. Blayne was a stockbroker for many years, raised hundreds of thousands of millions of dollars for different publicly traded companies. Blayne is now working with Doug there. They’re partners looking for new opportunities to acquire advanced gold development or gold production. Blayne also brings a huge Rolodex of relationships within the business. Doug Hurst was one of the founders of International Royalties that’s sold to Royal Gold, and years ago did very well on that. 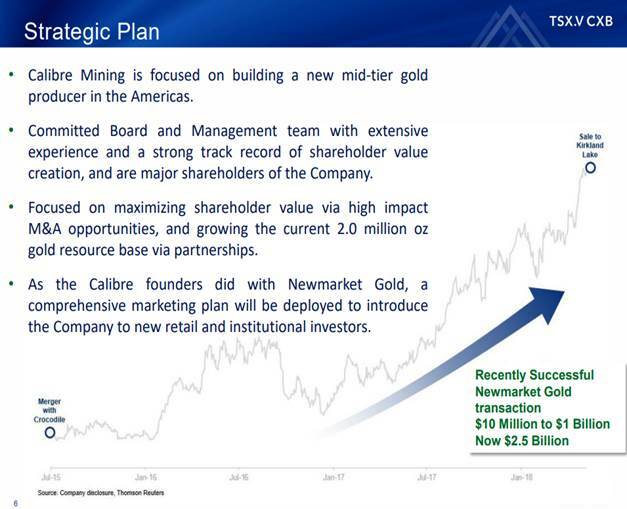 Of course, Doug is also one of the founders of Newmarket Gold. An incredible geologist within our group. Very analytical. Doug looks at projects, looks at spreadsheets. He was an analyst within the business for many years. Ed Farrauto, also one of the founders of Terrain Metals, which was, in 2006, acquired the copper-gold Mount Milligan project. He’s also one of the founders, with Doug and Blayne and Doug Hurst, of Newmarket Gold. Incredible, again, relationships and knowledge within the regulatory space and corporate governance. George Salamis, as some of your listeners well may know, is the founder of Integra Resources. He was the chairman of Integra Gold. I’m not sure, I might have had those flipped around. I can’t remember Integra. But George, yes, we very closely work with George over the years. George, of course, sold Integra to Eldorado for well north of $400 million, I believe. Again, somebody that’s been in the business for many years. He’s a geologist and understands capital market space and, of course, has eyes and ears within the industry, looking for opportunities. It’s a very well-connected board. I didn’t mention Greg, but Greg Smith is a geologist. He’s been working in Latin America, Central America for decades. One of the companies he had incredible success with geologically and on the ground was with Rusoro Mining. Rusoro had the gold projects in Venezuela. Unfortunately, Venezuela didn’t work out so well. However, Greg went on to find tens of millions of ounces there in Venezuela. He has really a track record of being able to find multimillion-ounce deposits. He’s very much one of the geologists that’s probably, from what I’ve known in my 15 years in this business, one of the best at finding new discoveries and advancing and finding more resources. We’re doing that as you can see in Nicaragua. I will just mention one other individual, a strategic advisor, he’s on our strategic advisory board, Darren Hall. Darren comes with decades of experience with Newmont. He was the chief operating officer with us at Newmarket Gold. He was overseeing thousands of employees when he was at Newmont in Australia. I think he was the general manager of Boddington, one of the larger open pit underground gold mines in Australia. Darren is very willing to roll his sleeves and work with us again on the next new opportunity that we come across. We’re privileged to have somebody of his expertise work with us again on, hopefully, will be a Newmarket, too, scenario. Maurice Jackson: Tell us about Ryan King. What makes him qualified for the task at hand? Ryan King: It’s sometimes difficult to look in the mirror and answer that question. I’ve been in this business now for a better part of 15 years. I started back in 2003. Right out of the gate, I was privileged enough to be able to work with Doug Forster, an ex-Placer Dome team that had been through, of course, production and development scenarios. One of the first companies that I really got ingrained into was a company called Terrain Metals. I’ve got a business degree, but I was able to learn on the ground, in the office through geologists, through engineers, through CSR specialists how to really take an operation, optimize it, advance it through the permitting stages, advance it through all the financing hurdles that you need to go through to build a mine. Throughout my career, I’ve spent days on the road with different CEOs with different skill sets. I believe that I’ve really learnt what works and what doesn’t work in terms of opportunities within the space, what people are attracted to, what people like, and then, very interestingly, when things turn, when markets turn, when there’s wind in our sails, when to allocate more capital to get the story out. So I have 15 years of experience on the ground. Luckily, I’ve been involved in two acquisitions; one, the Terrain Metals, which we sold to Thompson Creek for $750 million in 2010. Then another big success was Newmarket Gold that we sold for a little over a billion dollars. Both of which I was ingrained right from the beginning. I’ve worked very closely with the whole team and really trying to unlock value, getting the story out on different channels institutionally, helping raise capital, retail, and then any different ways to add value through corporate development, through new relationship, through strategic alliances and strategic shareholders. That’s my skill set. Yes, I think just basically the experience over the last 15 years and seeing the value that we look for in particular assets and merging that with capital markets is one of my strengths. Maurice Jackson: It’s one of those unique intangibles that you have an opportunity to be with that intellectual capital behind the scenes is something that you don’t learn in the world of academia. You just have to be there. What can you share with us about the technical team? Ryan King: I touched on the technical team briefly, particularly Greg and his skill set on the ground. Greg is the president and CEO currently of Calibre Mining. He has been since I believe it was 2010. Again, very experienced geologist. He oversees all of the technical aspects, geological aspects of the project. He’s got his fingers in every piece of the puzzle. In Nicaragua, Greg is very ingrained in looking at new opportunities, looking at geological potential, the outside potential. Very much on the ground. As I mentioned, we were just in Nicaragua. Greg, our executive chairman Russel Ball, and myself, we were kicking rocks, meeting the drillers, reviewing geological maps and potential. In-country, we have a very seasoned project geologist, Marc Cianci, who was with Barrick for a number of years, left, and started working with us in Nicaragua. He’s our number one ex-pat that lives and works in Nicaragua full time. Excellent geologist, has helped us identify new discoveries and grow resources there. I mentioned Doug Forster, an incredible database of knowledge this gentleman brings with his experience over decades of looking at different projects, see what works, what could work, what doesn’t work. Being a masters of economic geology adds a lot of value, but then being able to merge that with the capital markets aspect and what could help unlock further value is such a tremendous tool. Raymond Threlkeld put mines into production. Ray’s a geologist as well. He’s looked and identified new targets all the way from grassroots right to advanced exploration to be able to add value. Doug Hurst, the geologist. Darren Hall, the chief operating officer with decades of experience not only with operations, but the human capital aspect is an important part of it. It’s such an important part, especially when you’re overseeing thousands of employees. Darren brings a tremendous amount of expertise and experience on that. We’ve got a very well-rounded team with accountants, geologists, engineers. I believe that it’s the right mix for us when we go and we do make an acquisition, to be able to identify the good targets, the good projects to potentially bring into the company from multilevel aspects, all the way from additional exploration potential, engineering and mine optimization through to the various levels of regulatory and accounting details. It’s a good mix of a team. Maurice Jackson: All right, sir. We’ve covered your deposits and we’ve covered your people. Tell us about your capital structure. Ryan King: As of December 2018, 42 million shares issued and outstanding. We’ve recently completed a $5 million capital raise, a small private placement that we did at 44 cents. We did that with Sprott Global, with Rick Rule’s group. I believe Rick has identified us as a group that has been successful in the past, nice optionality with joint venture partners in Nicaragua. One of the things, I believe, that stood out for Rick was management’s ownership. I think this is very important anytime anyone looks at a very risky, early-stage exploration, even development-stage company, is do the management, the board, the founders, do they own stock and do they own it by buying it in the market? So often you’ll see different groups that own stock, but they may or may not have ever bought that stock. It may have been granted or gifted. We actually have hard dollars into the company. We’ve bought 10% of our shares in the market or in private placements. We all participated in the last round of the financing at 44 cents. We want to see Calibre Mining succeed. Even recently, you look at insider filings, you’ll see some of our directors, myself included, buying shares in the market, because oftentimes, at the end of the year, at the end of a difficult commodity cycle or a year, you’ll see tax loss selling. We’ve been seeing that recently currently trading at about 38, 39 cents a share. We all just believe it’s a great opportunity to acquire additional shares in the market, given the tax loss pressure, all resource, as companies have seen. We’ve got about just a little under $5 million in cash with a very relatively low burn rate, given that we’re not going to be spending any money drilling on our 100%-owned projects in Nicaragua in the short term. We just think the better value opportunity is to continue to look for additional either advanced stage gold projects or production opportunities. They’re not easy to find, they’re not easy to transact on, but because of the depth of our relationships, I believe that we’ll be able to pull it off. Maurice Jackson: For our members of our audience, I want to underline, underscore, and foot stomp when Rick Rule and Sprott Global Resource Investments, when they commit capital, that should get your attention as well. Ryan King: I will just quickly touch on two more shareholders that we have that I think is prominent and important. You mentioned Sprott and Sprott Global, Rick Rule. It’s very worthy of paying attention to smart, educated, well-known investors like himself. We also have a 9% shareholder, Lukas Lundin. Lukas was a board member with us at Newmarket Gold. He was a significant shareholder of that company as well. In addition, 12% shareholders in B2Gold. B2 has projects all around the world, but, in particular, it has two producing gold mines in Nicaragua, where we’re currently exploring. Good shareholders to have. Well over 30% here, or just a little over 30%, is owned by people close to the company, management, and very solid, well-known mid-tier gold producer, almost a senior gold producer in B2Gold. Maurice Jackson: Talk to us about the cash-flow distribution. Is it going to be used predominantly for optionality here? Ryan King: For the time being, given the landscape we see in the resource market, particularly gold market, we believe it’s best preserved and used for, let’s call it, due diligence, looking at new opportunities. It does require capital. Even though we have a great team of technically experienced, good director and management people, you always need to hire third parties to help analyze and assist in seeing if an opportunity has any red flags, seeing if there’s areas for improvement, seeing if there’s upside potential. At the moment, that’s probably going to be our use of cash, as well as rent and small salaries. Outside of that, if markets do tend to change, we might review drilling some more on our 100%-owned ground. As I have mentioned, we have numerous targets. We think there’s significant amount of potential to expand on not only resources, but make new discoveries. However, in the market, we have noticed that it’s not translating that much into new shareholder value in terms of drilling and expanding resources. It can be just what’s happening in the market today, it could be a bigger picture, but we believe we’re getting close to a bottom in the gold cycle. We believe that over the last number of years, stewards of shareholder capital management and board of directors in mid-tiers and senior gold companies have started to focus really on the margins of their ounces and being able to really grow not so much grow their production, but focus on cash margins of their producing opportunities within their portfolios. I think they’re really starting to evaluate and starting to put money to work properly. Whereas before it was not well-used capital allocations. I think that’s what got the sector a little bit offside for a lot of institutional shareholders unhappy with the use of capital. I think that’s changed. I think a lot is cleaned up. I think that we’re getting close to a new bull market, and we hope so. We’re going to be opportunistic now. Maurice Jackson: Did we miss any other institutional investors? Ryan King: We do have, I’m sure, a couple of different funds in there. It’d probably equate to about 10% to 15% funds are familiar with us. I won’t name any specific names. But, yeah, there’s probably about 15%, maybe up to 20% institutionally held within the company. Ryan King: The float I would say is probably currently somewhere between 30% and 40% of the public company. Ryan King: At this stage, I don’t believe there is. No. Maurice Jackson: All right, sir. You survived the storm. Mr. King, multilayered question here: what is the next unanswered question for Calibre Mining? What should we expect results? What determines success? Ryan King: I will answer that by saying, first and foremost, I think the largest significant impact Calibre will have for shareholders will be the acquisition of a producing gold opportunity that has opportunity to either expand in resources or optimize in cost in terms of potentially bringing cost down. I think that will have the most impact for shareholders of the company. I think it would transform the company. Well, clearly, it would transform the company immediately. We do have ongoing drilling with Centerra and with Iamgold. Over the next number of months, we’ll have drill results coming out periodically. One of the things about drilling when you’re drilling new targets is you hope to have good success, you never know. I believe that if we do have good success significantly outside of our resources, maybe larger widths, higher grade, they could have a very positive impact on the company. There’s a number of things that will outline success, and I believe it will happen between the next three and, let’s call it, nine months. We’ll have regular news flow. However, this opportunity for us to take advantage of the lower price to NAV opportunities in the sector. The, let’s call it, hopefully, low hanging fruit, maybe partner with a mid-tier company to try and unlock value. You see back in earlier parts of the 2000s, Goldcorp had been successful at that. It had vended out projects for shares. Companies, for example, Primero, had good success and Goldcorp did well on shares there. There’s many different ways to skin a cat. There’s many different ways to find new opportunities. Our group is very connected with numerous different parties within the sector, so I think we’ll have success. I’m very confident we’ll have success. The next unanswered question would just be what is the new opportunity? What is it going to look like? We are focused on precious metals, but what is it going to look like and how is the team going to unlock value for shareholders? Ryan King: I would say, if anything, what keeps management up at night is not getting into the game. What I mean by that is not being able to execute on our plan, and that is to acquire something that is either advanced stage or in production. For whatever reason, not being able to acquire it, costs get too expensive, structure doesn’t work, relationships fall apart, capital isn’t there, for some reason. I would say, if anything, we want to get in the game. We believe that there is a new bull market in precious metals coming. If there’s anything that keeps us up at night, it would be that, not being able to be a part of the next cycle. Maurice Jackson: Finally, what did I forget to ask? Ryan King: I think we covered most of the aspects that any sort of retail or institutional shareholder would want to know when looking at a company. I think it’s important to note that we’re all very engaged here. We do think that there is a great opportunity in front of us. In terms of what investors would look for, I think we covered off all the important aspects. Maurice Jackson: Mr. King, for someone listening that wants to get more information on Calibre Mining, please share the contact details. Ryan King: Absolutely. You can contact myself directly at 604-681-9944 or by cell phone 778-998-3700. That is the office phone number here in Vancouver, Canada. You can email me directly, [email protected], as well as, of course, get information from the website, www.calibremining.com. 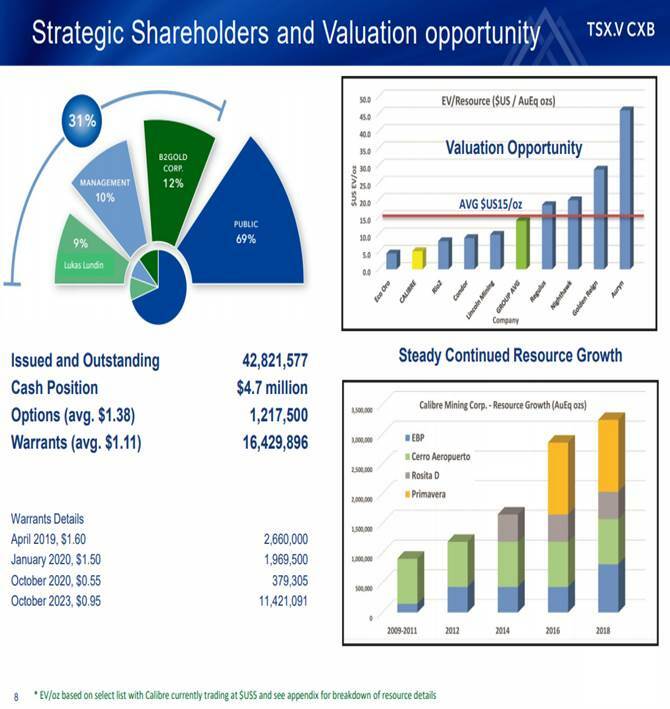 Maurice Jackson: As a reminder, Calibre Mining trades on the TSX.V symbol CXB. On the OTC, symbol CXBMF. Ryan King of Calibre Mining, thank you for joining us today on Proven and Probable.